LESSON 1: Who? Where? What? LESSON 2: Rockets Help Our Reading Skills Blast Off! LESSON 3: Stars and Sparks Have What in Common? LESSON 4: Spring is Here! LESSON 5: Shoot for the Stars! LESSON 6: What do you do at Night? LESSON 7: Day, Play, Say, Okay! LESSON 8: Where Would You Go? Students will be able to compose an opinion piece in which they tell a reader the topic and state a preference. Writing about why they think Earth is the best planet to live on, helps students express an opinion. Once everyone has found a suitable spot on the rug area I play the song Earth sung by Betsy Q. When the song is over I have the students take a seat back on the rug. I usually have at least one student who mentions the fact that the song says the Earth “…is a great big circle in the sky…” but Earth is actually a sphere. We discuss this fact together as a whole group. I use the Betsy Q song to help get the students thinking about the Earth as our home planet. The song provides two basic facts and then some reasons why we should take care of the Earth. Those reasons provide a basis for students to think about why Earth is a great planet to live on. This small piece of background information will help students formulate their opinion later on when they are writing. On the SMARTBoard I have already loaded the PebbleGo website. This website has many resources on numerous topics but it is a paid subscription site. Our school subscribes to the site so we have access to many research opportunities for our students. The site can be used either to introduce students to a topic or used to support instruction. Today I am using it to support instruction by opening the site to the Earth and Space section. Then I click on the Earth Science section and finally the Earth’s Features section. 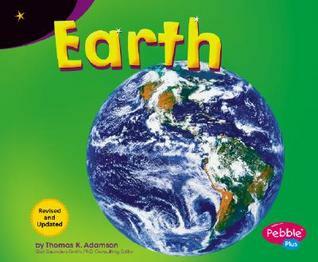 If you do not have the luxury of having this resource available at your school site you can use the book The Earth, by Thomas K. Adamson. I use the fair sticks to select students to come up and take part in clicking on the speaker to hear the narrator and also to click on the vocabulary words to hear the definition. I select enough students to respond to this question to cover most of the facts we have heard from the interactive reading experience. While the students are taking a seat around the edge of the rug I open up a writing paper screen on the SMARTBoard with the writing prompt on it. I just point to students to respond and when I have had enough responses I will repeat back what they all said to me. I select one of my more advanced writers to respond as I want the correct answer to be given as a model for everyone else. I select a student to come up to the SMARTBoard and point out the different colored lines. The student will point to each line and tell the audience what it is. I select a student to come and model the letter t on the board. I purposely select a student who I know will form the letter correctly as I want the students to see a well formed model. I follow the same procedure with a short letter (probably m or n) and a letter which hangs below the grass line (probably like y or g). Once again I just point to students until all of the resources have been covered. “Table number one let’s go have some Earth writing fun. Allow the students 15 minutes to work on this activity. Set a visual timer and remind the students to look at the timer so they will use their time wisely. It is important for students to be able to formulate opinions as this is a skill they will need to use in later life. We use opinions to make many different choices – like the foods we eat, the clothes we wear, and the person we elect to become a public official. While it is important to formulate an opinion, it is even more important to be able to rationalize why you hold that opinion. Later on students will become aware of the difference between popular opinion and having your own opinion. If they are going to choose to go against popular opinion they need the skills to be able to explain their opinion clearly for the opposing point of view and rationalize their stand with facts or physical evidence. Once the students are seated I tell them that their exit slip for today is to read their opinion to the rest of the class. I use the fair sticks to select the order of the students. Once a student has read their opinion to the rest of the class they are able to use the hand sanitizer and go to get their snack. I use the Best Reason to Live on Earth Opinion Checklist to go over the student’s work and once it is complete I will place the student’s work in his/her collection portfolio. The checklist can be used to guide my instruction as I have evidence of the student’s capabilities and will use that information to scaffold instruction accordingly. The checklist is also a nice way to keep families informed on their student’s progress in the classroom. Students make a painted Earth by having a circular sheet of white construction paper. They fold the paper circle in half and open it up whole again. Now the student dabs blobs of blue paint, white paint and green paint over one half of the paper. Next the student closes the paper along the fold they created previously and gently rubs it with an open hand. When they open the circle out whole again the colors have all mixed and swirled together to make an image a lot like looking at Earth from space. They glue Earth facts on the back and then we hang the Earths from the ceiling. We use the Earth is, looks, and has cards to sort Earth statements such; round, water, air, etc. We discuss the selections as we make them. For example a student may put round under looks, but another student might want to put it under is. Both selections make sense and it makes for a lively discussion at the table. Kindergarten ELA Â» Are You Afraid?